Type: BARGAINS. Detail: SAHOVSKI. Product Code: 03511375-091A. Every volume of Chess Informant offers a selection of the best games played by the world's greatest chess players. Over 90% of the games are annotated by the players who played them. The classification code system facilitates the search by openings and variations, and the system of annotation signs and symbols is perfectly understandable to everyone. There are also the most interesting endings, combinations, the ten best games and the ten most important theoretical novelties from the previous volume, tournament crosstables and thorough indexes of players and annotators. 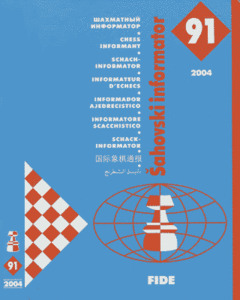 Chess Informant 91 contains 495 annotated games and 501 variations. Best of the Best 1001-1100. SAHOVSKI. $19.95.